Defense Minister Avigdor Liberman eulogized the IDF officer killed Sunday night during fighting in the Hamas-ruled Gaza Strip, while the slain officer’s identity remains classified. "Last night Israel lost an incredible warrior, whose contributions to the security of the state will remain classified for many years to come,” Liberman tweeted. “I would like to express my most heartfelt condolences to his family, and to wish the [soldier] wounded in the incident a speedy recovery." "IDF officer, Lt. Col. M., was killed last night during operational activity in the Gaza Strip. His family has been notified. The IDF extends its heartfelt condolences and will continue to support the family." Lt. Col. M. was killed on Sunday night during an operation in the Gaza Strip, while a second IDF officer was wounded. He was later evacuated to Soroka Medical Center in Beer Sheva, where he was listed in moderate and stable condition. 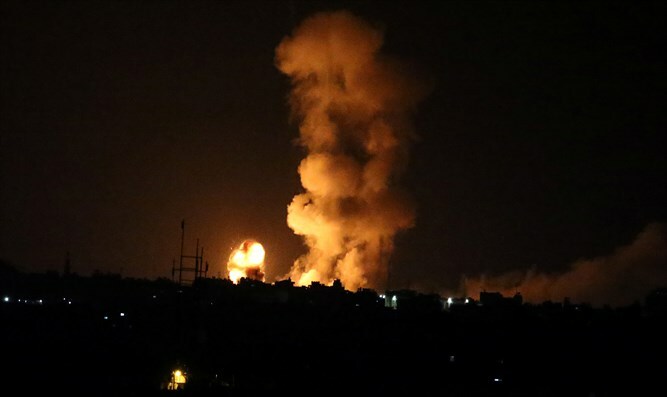 A total of seven Hamas terrorists were killed during the fighting in Gaza overnight. Arab media outlets claimed an undercover IDF force was operating near the Gaza city of Khan Younis Sunday evening, when fighting broke out between the unit and Hamas forces. Israeli fixed-wing aircraft and helicopters fired dozens of missiles, Arab outlets claimed. One of the terrorists killed in the battle was later identified as Nur Barakeh, the deputy commander of the al-Qassam Brigades.